The African Development Bank Group President Akinwumi Adesina and Mustapha Bakkoury, President of Moroccan agency Masen (Moroccan Agency for Sustainable Energy), have signed a letter of intent marking a new cooperation initiative as part of the ‘Desert to Power’ programme. The ceremony took place on the first day of the Africa Investment Forum, in Johannesburg, South Africa. The goal of this partnership is to support African countries, especially those in the Sahel region targeted by the ‘Desert to Power’ initiative, to develop renewable energy technologies adapted to their natural environments and specific energy needs. Masen’s expertise in renewable energy will be combined with the operational experience of the African Development Bank to strengthen regional integration, focusing on the transfer of technology, capacity building, technical assistance, and project development in renewable energies and resource mobilisation. “Morocco is a reference in terms of renewable energy,” said Akinwumi Adesina, President of the African Development Bank, at the signing ceremony held Tuesday. “When I visited the Noor Ouarzazate complex, in which the Bank has invested considerably, I was fascinated to learn that it had been built using Moroccan know-how. It is proof that Africa can achieve great things, and perform to international standards.” Adesina added. For Mustapha Bakkoury, President of Masen, “Sharing the experience that Masen has developed and launching a drive for the competitive development of renewable energy across Africa is commensurate with the goal of making renewable energy a real lever for inclusive growth. This partnership with the African Development Bank will contribute to the realization of that ambition. The signing ceremony was attended by Morocco’s Finance Minister Mohammed Benchaaboun and Salaheddine Mezouar, President of the General Business Confederation of Morocco (CGEM), a clear indication of the importance of this partnership. The Bank Executive Director for Morocco, Abdelmajid Mellouki, the Bank’s Director General for North Africa, Mohamed El Azizi, and the Country Director, Leila Mokaddem were also present. For the Bank, this partnership is a way of further strengthening its continued and outstanding cooperation with Morocco. With commitments of over US$1 billion, renewable electricity production projects (solar, wind and hydro) account for some 80% of the Bank’s portfolio in the Kingdom’s energy sector. In particular, the African Development Bank was the foremost financial contributor to the 160-MW Noor Ouarzazate power plant in the Noor Ouarzazate Solar Complex, contributing nearly 30% of the total investment cost. The Bank is also participating in the funding of Noor Ouarzazate II (200 MW) and Noor Ouarzazate III (150 MW). Morocco has the ambitious goal of increasing its share of renewable energy to over 52% by 2030. The Kingdom is hoping to share its renewable energy development model with the whole continent, with the goal of contributing to the acceleration of Africa’s energy transition as part of its sustainable and inclusive growth. “It should be possible for our expertise to spread over the entire continent,” said Moroccan Minister of Economy and Finance Mohamed Benchaaboun, at the signing ceremony. 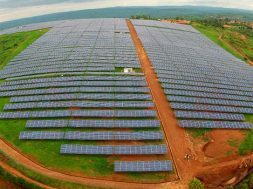 More broadly, this operation contributes to the achievement of the New Deal on Energy for Africa, which is intended to install 10 GW of renewable production capacity by 2025. The signing ceremony was held on the first day of the inaugural edition of the Africa Investment Forum, an African Development Bank initiative created to accelerate achievement of catalysing development projects in Africa and to involve the private sector. It will do this by reducing the risks and intermediation costs associated with large-scale investments and by tracking transactions through to completion. This first investment marketplace event in Africa is being held in Johannesburg, South Africa, until 9 November 2018. Masen is the agency responsible for steering renewable energy development in Morocco. Its programmes to develop integrated projects have the goal of increasing the share of renewables in the country’s energy mix to 52% by 2030.